Amy's Creative Pursuits: Decorating My Dining Room For Spring! It is officially SPRING! Spring is my favorite season. I love the weather, and all the life and energy spring seems to bring. It is a time to clean, refresh, and start anew. 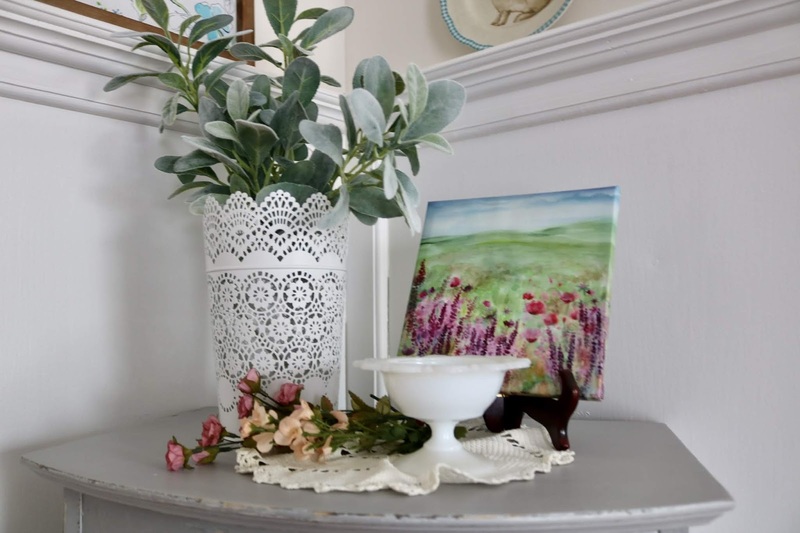 I was so excited to decorate my dining room for spring this year, because I re-painted it over the winter with "Colonial White". 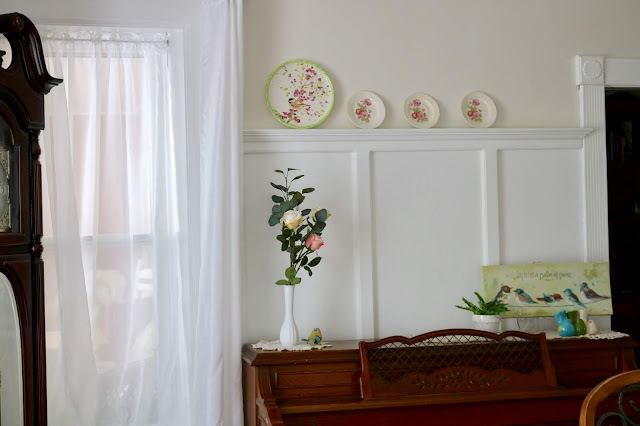 Before the walls were a deep red, which made it difficult to decorate for spring since the pastel colors clashed with the red. But now that I have a neutral background, I can decorate with any color and it looks fabulous! The dining room is open to the living room. Re-decorating the living room was our major project this winter. We put in new floors, painted the walls "Colonial White", added a new runner, and ordered new furniture. It still is not finished as we are still waiting on one furniture piece to arrive and my husband is custom building the rest. So for those of you who have anxiously been waiting the big reveal, you will have to wait a little longer. I will say however that the recliner arrived and to my surprise it LOOKS AMAZING in the room so I was worried about it for nothing (see this post if you have no idea what I'm talking about. 😄). 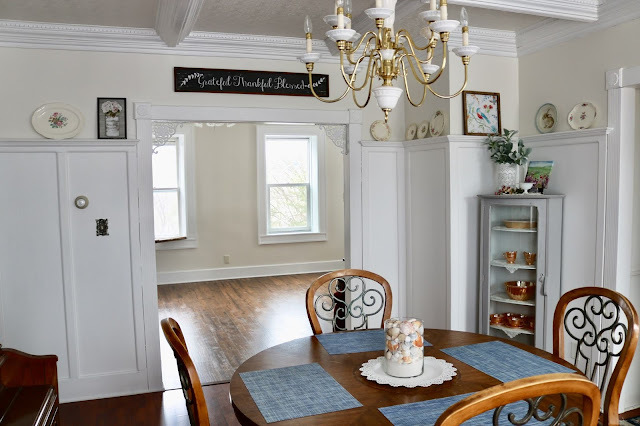 Once I re-painted the living room, I knew I had to re-paint the dining room and office as well. All three rooms are open to each other, and the dark red walls seemed to conflict with the all white walls. I love how my semi-open floor plan seems even more open because all three rooms are now the same color. It looks like one big room instead of three little rooms; and, everything is lighter and brighter! Whoever said to "Paint small rooms dark to make them cozier" is an idiot. It doesn't make them cozier, it makes them smaller and darker. Light paint makes a space bigger, brighter, and happier. So now that you have an idea of the layout lets take a closer look at the decor! Because it is a dining room, I thought this chalkboard sign above the doorway was fitting. I purchased it at Hobby Lobby. 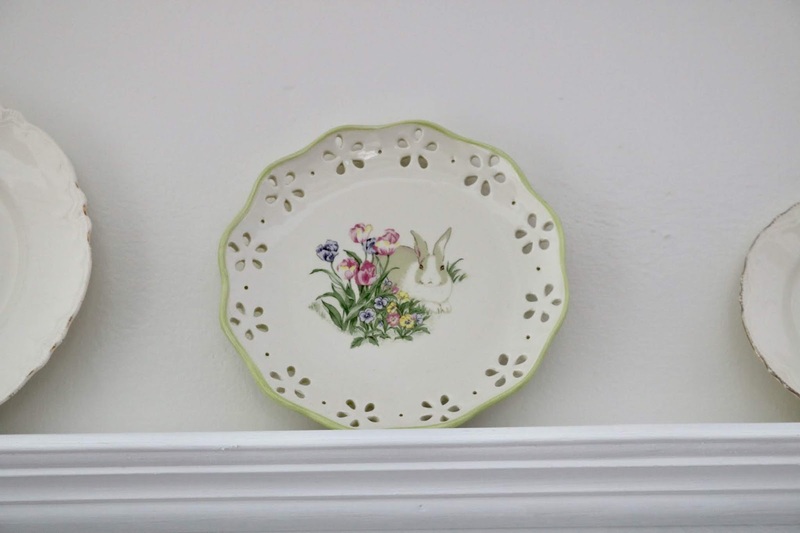 Since Easter is almost here, I put out my Easter plates on the plate rail above the paneling. 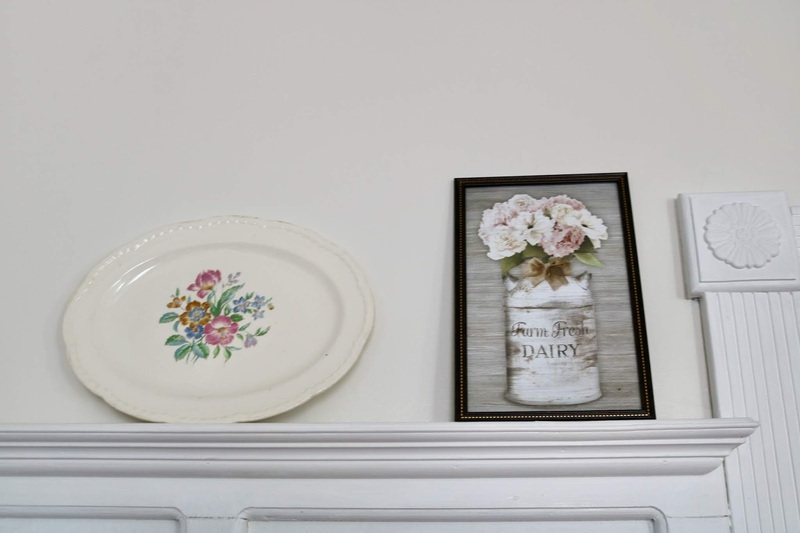 I wanted to put items on my plate rail other than plates. I was so excited to find these pretty photos at the Dollar Store. 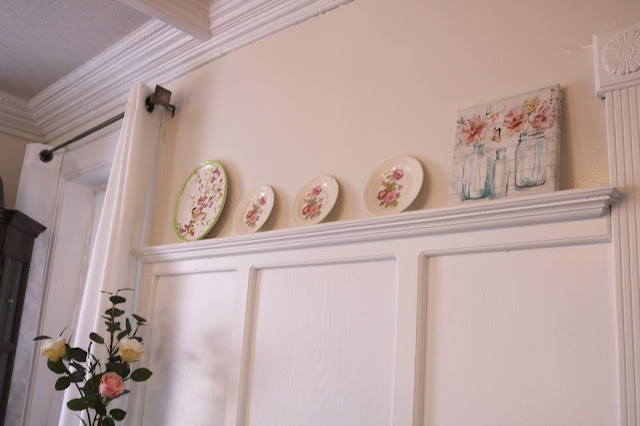 The plate rail runs all around the room. 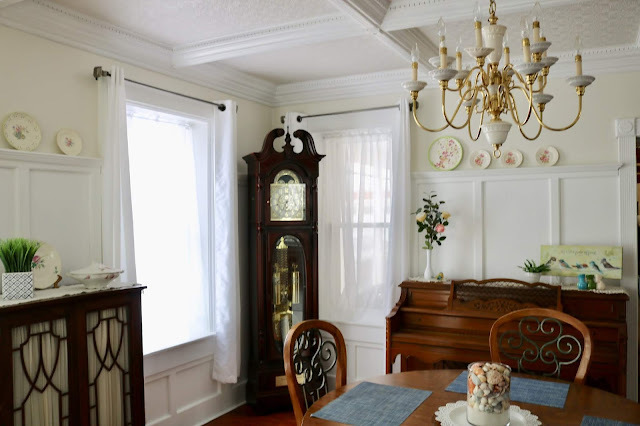 The paneling is painted Ultra White, so the Colonial White on the walls provides a bit of contrast. 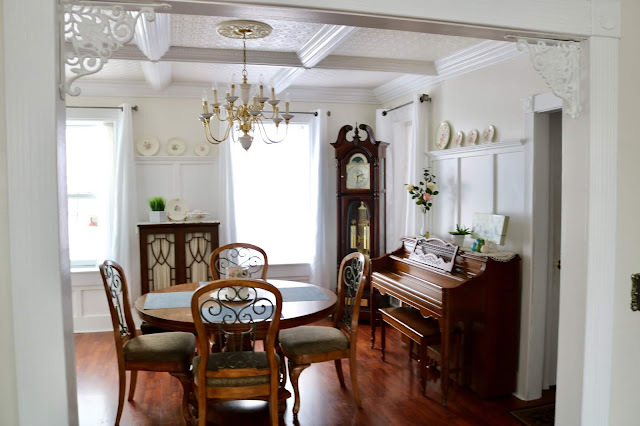 In the dining room are five pieces of furniture: two hutches, a piano, a grandfather clock, and the dining room table. This hutch is an antique from my mother's side of the family. The beveled glass broke years ago when one of my children smashed into it. I never replaced the glass, but just hung a curtain inside. 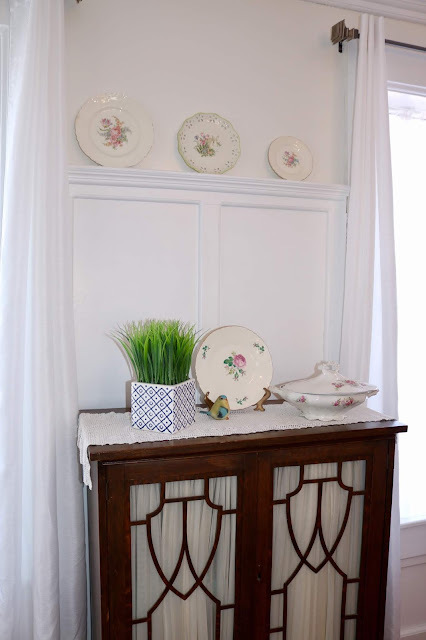 I'm tempted to paint this hutch with chalk paint a cream or a robin's egg blue since my other hutch turned out so great (see this post here if you missed it). But, it is an antique in good shape other than the missing glass, so I'm having reservations. What do you think? This spot is right above the piano. I brought out all my spring plates, focusing on plates with pastel colors or bird images. For the top of the other hutch that I painted with chalk paint, I placed a white vase (Ikea) filled with faux Lambs Ear. 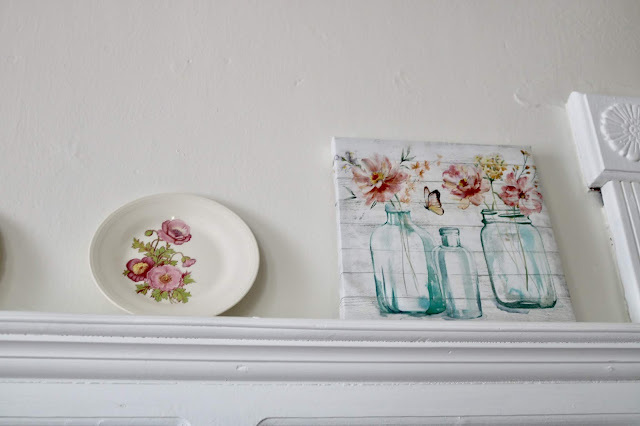 I added a doily, some milk glass, and another Dollar Store painting. I put the painting on an easel, and threw more faux flowers underneath. 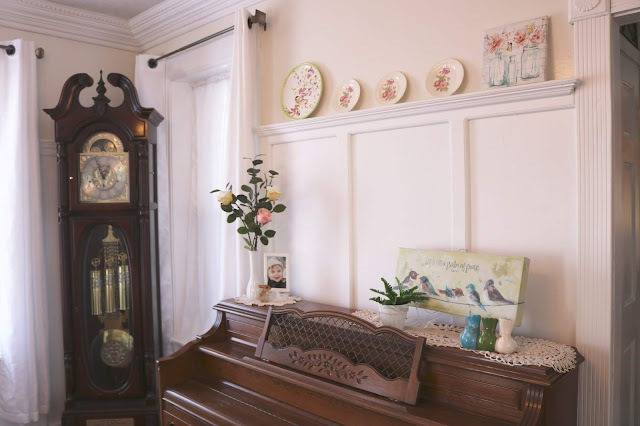 For the piano, I added more white doilies to help break up the large expanse of brown furniture in this room. On top I place a milk glass vase filled with faux roses from Ikea. 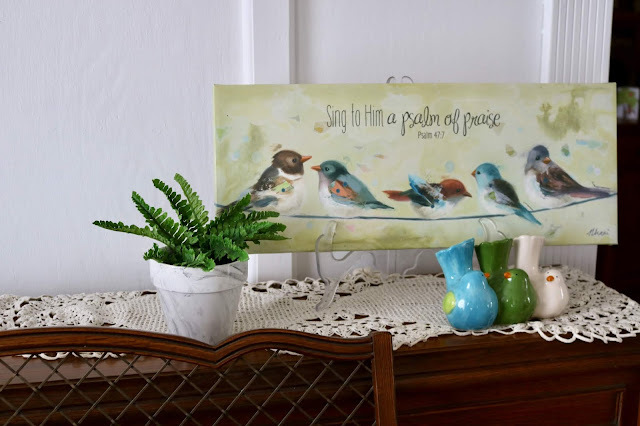 I put a bird painting on an easel, a faux potted plant, and added some bird statues. Chickadees are one of my favorite wild birds. 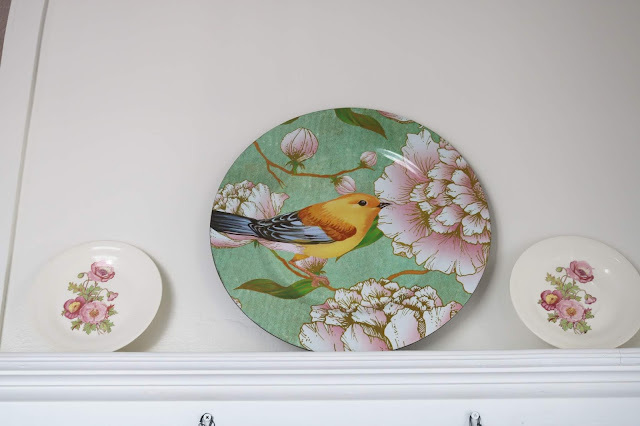 I fell in love with this plate when I saw it at a HomeGoods store years ago. 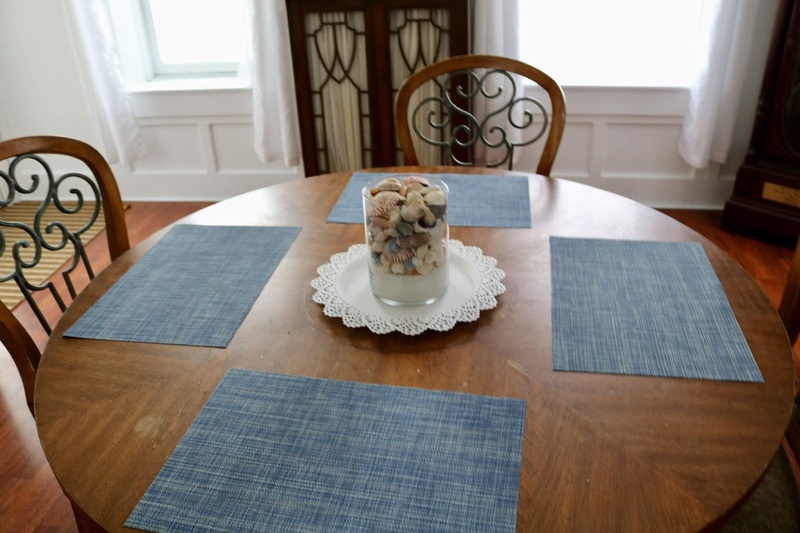 For the table, I added some blue place mats. If you remember in my painted furniture post I was considering painting the table. Most of you said not to do it, so for now, I'm heeding your advice. In the meantime, I added this white tray and blue place mats, and I felt they really helped break up all the brown in this room. The place mats are wipe able, so they are not a nuisance. The centerpiece is a Ikea tray, and a glass container filled with white sand and shells from a vacation to Pensacola, Florida. I have since replaced this with a Easter metal tier tray which I will show you on Tuesday! 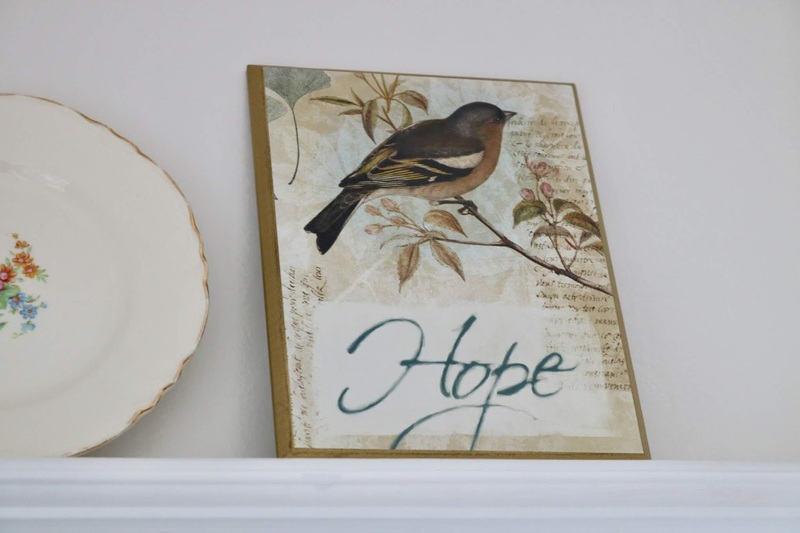 I found this BEAUTIFUL bird picture from Hobby Lobby. Can you tell I have a thing for birds? Birds and cats...how ironic is that? I said to my daughter I was worried my dining room was getting "too birdy" since I had so many bird plates, bird pictures, and bird statues. But I can't help myself, I am so drawn to them! I also added another bunny plate for Easter. 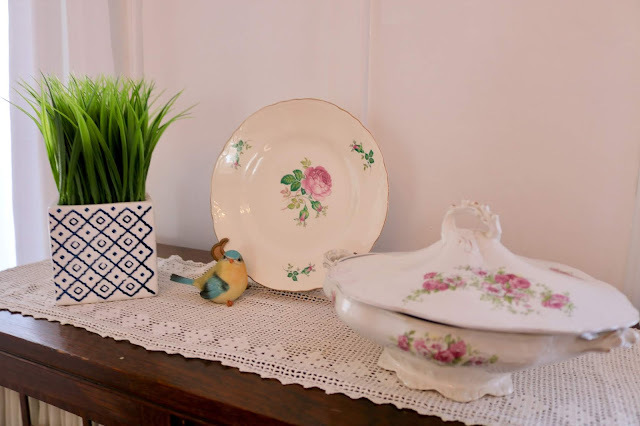 On the antique hutch I placed vintage china, a dollar store bird statue, and some greenery. Here you can see the hutch I recently painted with chalk paint. I filled it with vintage peach lustreware. 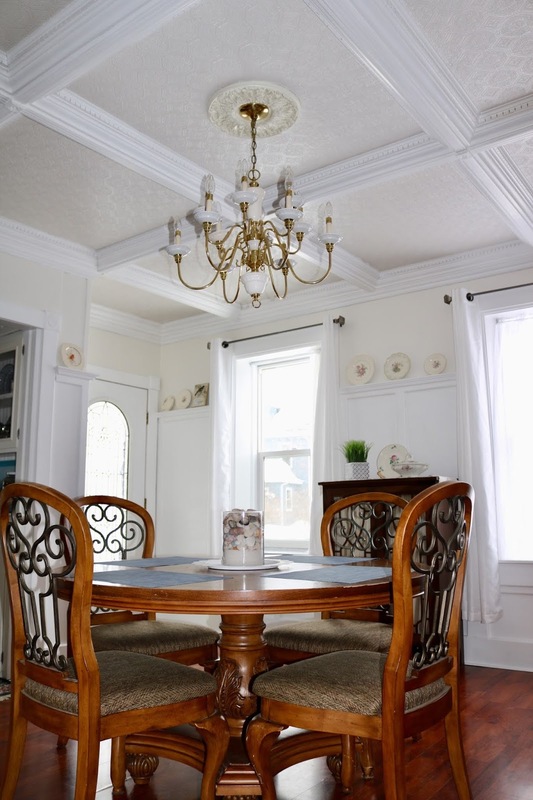 The ceiling is a coffered ceiling with embossed wallpaper. 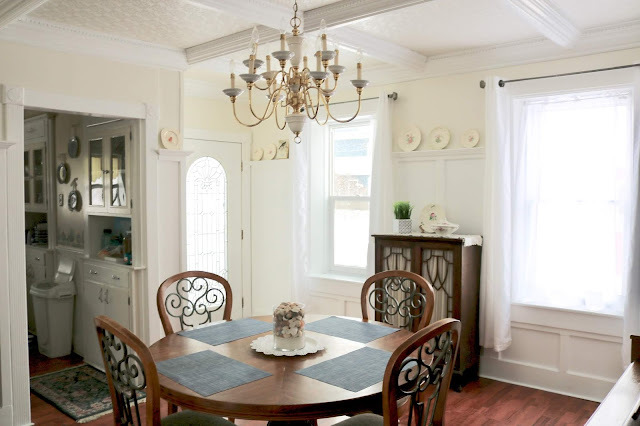 You can also see the pedestal base of the dining room table in this picture. Some of you suggested painting the "legs" of the table, but it's actually an intricately carved pedestal . I really don't want to paint it. Here is a close up of the piano spring decor. I thought this painting was perfect to place on top of a piano. White curtains and sheers hang on all three windows. A glass beveled door opens to the front porch. 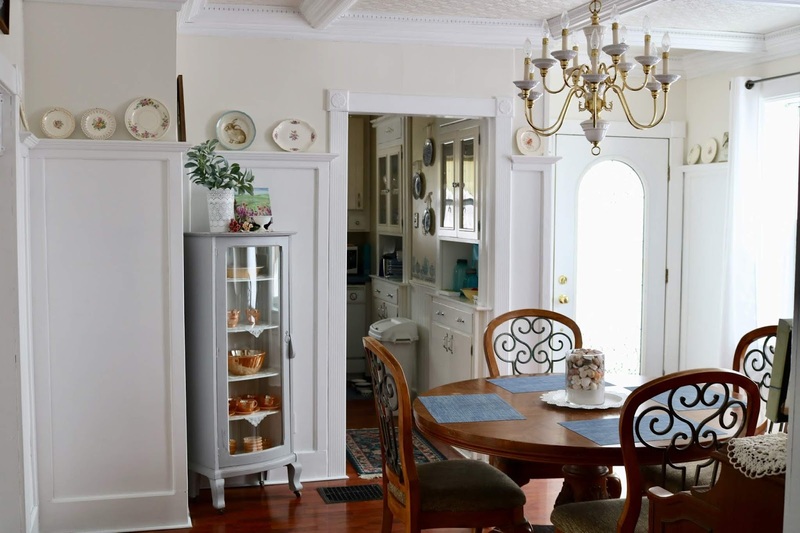 The dining room is open to the kitchen, office, and living room. 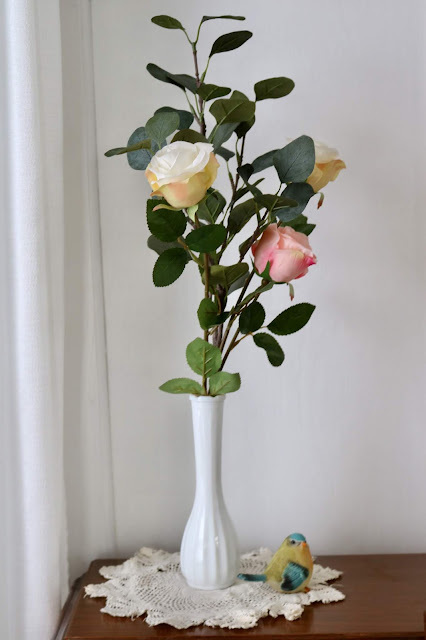 I love to shop Ikea for artificial flowers and greenery. They are so realistic looking and the prices are reasonable. 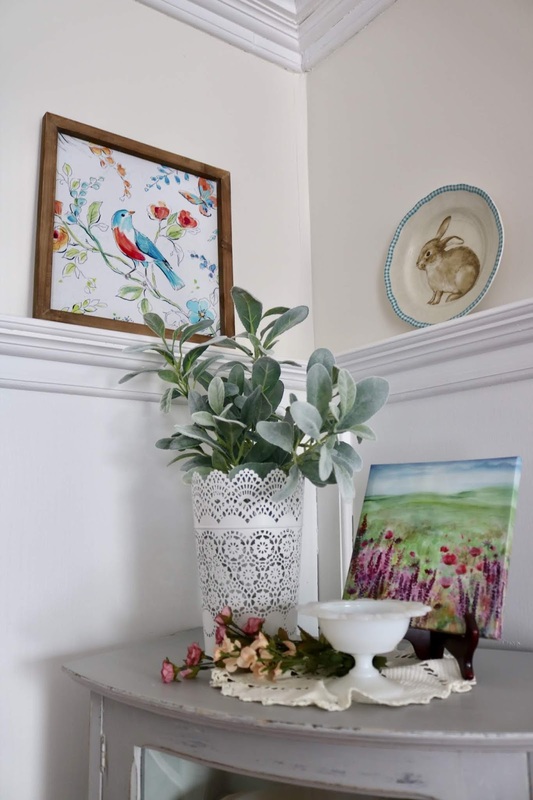 I had a couple of old bird prints in my craft room that I brought up and put in this room for the spring season. The platter is vintage, and the picture was another Dollar Store find. I hope you enjoyed my dining room spring tour! I didn't do too much elsewhere in the house as the living rooms are both under renovation. I spruce up the bathrooms and kitchen a bit with spring soaps and towels, and I change out the floral arrangements in the bedrooms and hallways with spring ones as well. I still need to get outside and take down my winter decor and put up spring decor on the porches. I'm waiting for a warm day to do that! Our weather has greatly improved, but we still have a bit of snow and ice that needs to melt. We never had a dark painted room, I can imagine it must have taken a long time to cover the walls. I did like how it looked before, but it looks so open and bigger now! Love all the bird themed spring decorations! By the way, I decided to paint our old (and in need of replacement) bathroom furniture with rustoleum chalk paint and three coats of that finishing paint. I followed the same instructions of distressing it, got new hardware and it looks like something I bought new now. I painted it with the linen white chalk paint and it instantly made the bathroom look so much brighter. (The furniture was brown before.) I was worried it wouldn't work in a bathroom but it's been holding out really well so far. Thank you for introducing me to that paint! Soon I will paint an old desk I have in my craft room, that I bought from a second hand furniture store. Oh I’m so excited! Isn’t it addicting. I keep going through my house wondering what I should paint next. You need to do a blog post now. I’d love to see it! Oh, it took one coat of primer and two coats of white paint to cover up the red paint. Not too bad! Thank you! 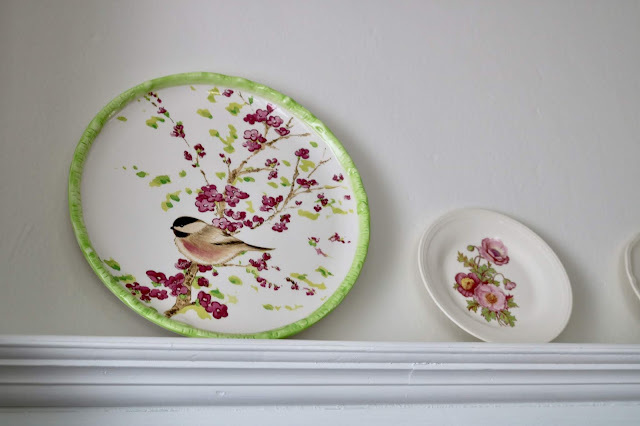 I'm a sucker for pretty plates, I want to buy them all and I have to hold myself back! Oh Amy this is all just stunning! I love all the vintage touches. Your ceilings and woodwork is amazing and the bright paint is gorgeous. Thank you so much for sharing with us again at Thursday Favorite Things! Oh, this is all so pretty! I love all of the spring touches, and the clean color scheme. I have an antique serving cabinet that was my mom's. I have been wanting to paint it, but everyone tells me not to. So, I am torn about that kind of question! Thanks so much for sharing at Thursday Favorite Things! Thank you! I know it’s so hard to decide “To paint or not to paint”, cause once you do there’s no going back. I think it all depends on what kind of decision the piece is in and it’s value. So pretty. I love all of the bunnies and birds you have added to the space. So bright and cheerful. I think chalk paint is wonderful. I don't know how I ever lived without it in my life.TFS with #BloggingGrandmothersLinkParty. Thanks Clearissa! I’ll definitely be using it more now! Beautiful tour! I am so happy to feature you at TFT this week. Thanks for sharing! That's exciting news! Thanks so much. I'll be sure to put it on "Where I've Been Featured" page!